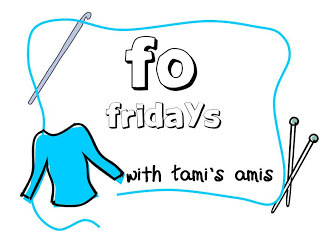 For this edition of FO Friday, I have two things that were completed to share with you. I’ll share the crochet one first. My August Augusta Shawl, in Manos del Uruguay Serena, is finished and that means I have successfully completed Camp Loopy 2013! I am quite impressed with myself that I did it. 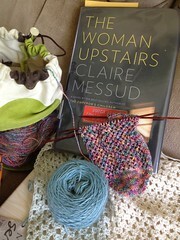 I love the idea of KALs and I love to join whatever popular knitting thing is going on, but I rarely follow through. I get distracted easily, life happens and all the rest. The Augusta Shawl is perfect for newer crocheters (you do the same stitch until the skein runs out, switch colors, repeat) and was the exact sort of project I needed for working on something while watching TV. And now that it is done, I’m sad. I feel like all my projects are fiddly and require attention. I’m on the lookout for some sort of appropriate replacement (yes, even with my pile of active WIPs). The other big accomplishment this week is that school has started and the Lorax is now a Kindergartener!! You could knock me over with a length of laceweight yarn because even though I have been looking forward to this day for a long time, I can’t believe it is for real. It’s really happening, we put her on the bus and away she went. While waiting for the bus we were taking some silly pictures, including this one to show how strong we are. Awesome. She got on the bus without much fuss and when she came home she bounded off the bus, all smiles. Phew! It’s the Wednesday before school starts and life is fiddly. We are getting ready for the start of Kindergarten for the Lorax and early preschool for the Nutmeg. I have what feels like a million things going on in my head (label this, read that, pay attention to this schedule, wait! who needs shoes / pants / etc, wait! you need a binder and page protectors? for kindergarten?! Fill out those forms!). I have actively worked on all these projects this week and they are all fiddly right now! 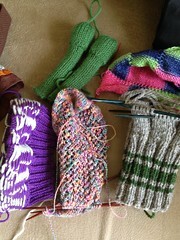 I am enjoying working on them but as I have finished my Camp Loopy project (yay! stay tuned for Friday!) 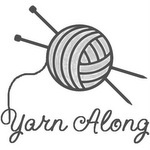 I now have no auto-pilot knitting! For shame! Time to cast on something else 🙂 Maybe I will be able to try a plain toe-up sock again. I think I will need a project for waiting on the school bus and parking lot pick ups. The purple-white item on the left is to be a gift so I can’t say much else about that. 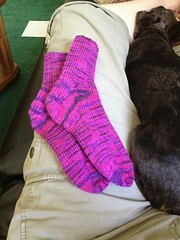 I picked up the Simple Summer Socks again and am in the middle of the heel. Above those are two green arms for Terence, the tap-dancing-dinosaur. I want one of these for myself and will likely knit him again after a while, although I read ahead in the pattern and his feet? Essentially socks. 16 stitch wide socks. Oy. The grey / green stripe is the first of what I’m calling DPH Socks (original pattern: IBH Toasty Toes), in Green Mountain Spinnery’s Weekend Wool – love this yarn! I almost used a skein to make that new Mary Anne Hat, but instead will put it on my shopping list for Rhinebeck. And then above them are my Carousel socks. when I took that out of the bag to photograph, I pulled out the needle and then couldn’t get the stitches picked back up proper so I pulled out about 1.5 inches of work there, ugh. There is one more sock pattern I have started, a pair of knee-highs for the Lorax, not included in the group shot. I have the toe of one sock done and wanted to get the second one set and then work them two-at-a-time. That technique is really growing on me! 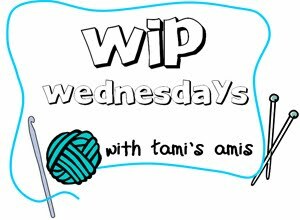 I am super excited for this FO Friday as I can finally share a few items that have been under wraps for a while. My niece, Violet, made her arrival last weekend and she is just wonderful. Little Violet is surrounded by a great number of handcrafters – her crib has a beautiful quilt and her closet is already stocked with hand-knit sweaters and dresses (her mom and grandy are knitters). Of course I also want to make things for my niece too, so I am taking on toys. To start, I made a little doll. When I finished this item, Lorelai saw it and wanted one, so I’ll take that as a compliment. The instructions to crochet this were straightforward and it worked up pretty quickly. I used Sublime Organic DK for all of it. It’s a bit hard to see in my photo here, but the hairstyle is a bun, and I went with a simple light purple dress. I think it’s a little Jane Austen-ish, which works as Mom is a fan. I would make this pattern again, and I would like to make the fairy version too. When I started knitting I first made baby hats and I had my eye on the flower hat pattern for ages. I tried the original pattern, written bottom up – so you make the petals first – but my gauge wasn’t quite right, it was too open in between the stitches. I put it aside for a while and when the top-down version was released I gave it another go. Lucky for me it worked! The hat has a little bit of stretch, and it fits her now (enough for a photo anyway). I blocked it over the glass carafe of a small french press; I wet it and pinned the petals back to add a bit of curl. It is so much fun to consider other baby patterns again! I’m looking forward to many more toys and accessories. We’re in the back-to-school-prep-zone this week. Why do I want to start a million new projects (not necessarily knitting or crochet related) when I know there is only so much time in the day? A new school year feels like a fresh start, even if I am not the student anymore. In between party prep, party clean-up, figuring out how to prep for the new school year, I have no reading material aside from school documents. I let the hold on the ebook lapse, oops. I have been making decent progress on my projects though! Last night I finished the 4th skein in my August Augusta Shawl for Camp Loopy, yay! I don’t want to jinx myself, but I am in decent shape to finish on time! I am working on a Terence-tap-dancing T-rex for a swap (sadly, long overdue!) and I brought the Carousel socks to swim lessons. I would really like to finish them. I think they are going to be 2 different heights and I’m ok with that, because really who is going to notice? I have had a lot of trouble measuring these for the lengths. I have a bit more on the foot, then I will be picking up stitches for the cuff, toes and heels. What a weekend. We had a small family party for Nate’s 2nd – it was a bit last minute in the planning, but in the end worked out just fine. The general theme of construction / trucks worked out well. A few photos! I got to play a bit in photoshop which was fun, and then of course I was scouring pinterest for ideas too. I picked up a bunch of little toy trucks that Nate is already quite taken with, and even pulled out Jackson’s Halloween costume for part of the decorations! When I saw this post about the caution tape on the inside cake I knew I had to try it. I have to say, having a construction theme works so well for the cake, because if it turns out to be a bit wonky, who cares? It adds character 🙂 It worked out pretty well even though I used boxed mix and store frosting and I’m pleased. I think Nate had a good time, that’s all that matters. Oh yes, the guests had fun too. And to top off the day (or start the next one) we got the news that my brother and SIL had their baby, and we’re looking forward to meeting her this week. That also means I will finally get to share some secret projects this week! Sunday was very much a down day for us – I think we all have party hangover. 2. Breakfast: Bacon and eggs, egg sandwiches (especially good for dinner! ), pancakes or french toast. 8. Good pizza topped with lots of meat. 10. Any delicious meal that I didn’t have to plan for, cook or clean up after! This may be the turning of the tide! I finished the socks for the Lorax this week. I held back from outright giving them to her mostly out of fear that she would balk at the idea, so I just left them on the table. She found them and brought them over to me, “Here Mom, you forgot your socks!” I told her they aren’t mine, they are too small, they probably would fit her. She sat right down and put them on right away. Then ran around the house and tested out how slippery they are on the floors. Score! They fit, they look cute, and she can put them on, and she seemed to like them. Now the test will be if she actually wears them. 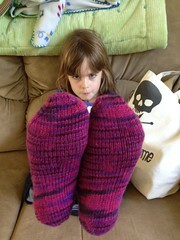 She did put them away in her sock drawer (“for winter” as she told her dad last night). And this kid, my baby, is now 2!! Amazing. He’s my baby but changing so fast – he’s quite verbal and such a boy and so similar and so different from his sister. A parenting email I got this week that discusses developmental stages and ages topics started with this, “Your Preschooler: 2 years old!” Wait, what? When did being 2 make you a preschooler? I thought I had a toddler for a bit longer. He is headed off to a “school” program for 2 year olds in a few weeks, but c’mon – we all know it’s just in the middle of daycare and preschool. We’re doing a small family party this weekend – general trucks / construction trucks theme. Should be a good time!